Are you a proper Ronnie O’Sullivan after a few beverages? Then rack ‘em up! 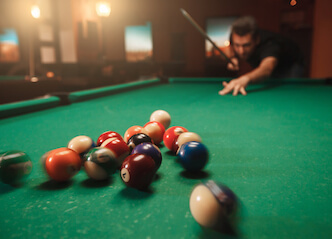 After an awesome day amid the Queensland sunshine, get a pool table reserved for you and the lads to do battle! With drinks at your fingertips, and bar snacks available too, you can get a wicked start to your evening with some friendly – or not so friendly – competition. Don’t forget to call that 8 ball shot! Your table awaits you at this cool venue, where bar snacks and drinks accompany the sound of cracking breaks and painful misses! Let’s face it – the sun can beat you up after a while. If this is the case, then you are likely looking forward to an indoor activity, and here you are! Set up the tournament, and either break in to teams, or play a round robin between yourselves individually. Bragging rights – and perhaps a drink or two – go to the victor! Every evening needs a precursor! Get a few drinks in and feel the spirit of battle, as you duke it out on the felt. Who has the deftest touch? Play some defensive pool and watch your opponent struggle not to scratch! Sure, it isn’t altogether ‘sporting’, but I thought you were here to win? Did they juuuust miss it? Let them know about it. They already know, but why not remind them of their abject failure? And do it loudly. Taunt the loser, cheer the winner, toast to the Buck, but don’t take it easy on him! Most of all, enjoy these waning days of freedom – for him, they are grinding to a halt. To the good times! Take this energy and break out! The strip in Airlie Beach provides a party that far exceeds its population. Enjoy your night, lads, you are losing a man to the altar in short order! The Airlie Beach community has been around for a long time, but it is only within the last thirty years or so that people have discovered what this stretch of the Queensland coast offers you. It might be named for its Scottish namesake, but it is hardly cold and rainy. You are partying in paradise here! One of the best elements of this town? The ability to party in so many different ways! Your Bucks party here in Airlie Beach puts you within striking distance of a number of world-class attractions. Ever heard of the Great Barrier Reef? That’s just where the fun starts. So what else can you get up to here? Cruise the Whitsundays. Take to the high seas and explore this unbelievable stretch of real estate! The best part? It’s all national park, so there are almost no interruptions to your view here. Palm trees. White sand beaches. And a goon sack or two for a pillow. Want a bit more individuality to your tour? Why not tour the islands on a jet ski? These machines are a thrill to ride, and along with a lunch among the islands, you can get a sense for their power when you crank that throttle! Kayaking. Yeah, it isn’t as quick as the rest. But it’s quiet, which gives you the chance to sneak up on some of the wildlife that occurs here. Sea turtles, sharks, huge numbers of fish species, sea birds…they are all within viewing distance. Keen to get a good sense for the size and scope of these islands? A tour from the air is calling your name! An excursion flight sees you experience the grandeur of the Whitsundays from aloft, while your pilot gives commentary on the highlights. Not a bad view, at all – in fact, one of the finest! At Wicked Bucks, we can craft an Airlie Buck Bucks party that will knock off some socks. Chat with us and let us make it happen for you and your Buck!